Our specialty. Get the connectivity you need. Get the control you need. Get the exact solution you need. Remote switching and monitoring is pretty handy. It’s even better with EMI filters and EPO. Standard, yes. Common, no. Our basic PDUs come with integral power conditioning, EPO, and more. Overcome the limitations of standard PDUs. Protect equipment with integrated power conditioning. Save space by consolidating power conversion and more. Simplify your project by having us manage development through certification. 1-Phase, 3-Phase, DC, 400 Hz — up to 400 amps. 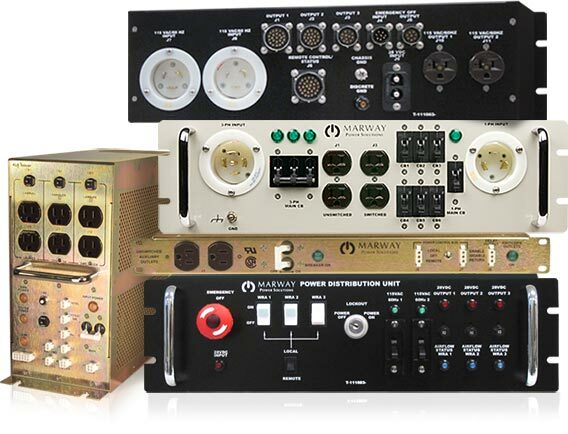 Marway specializes in custom PDUs optimized to meet application-specific needs for industrial, military, and OEM applications. 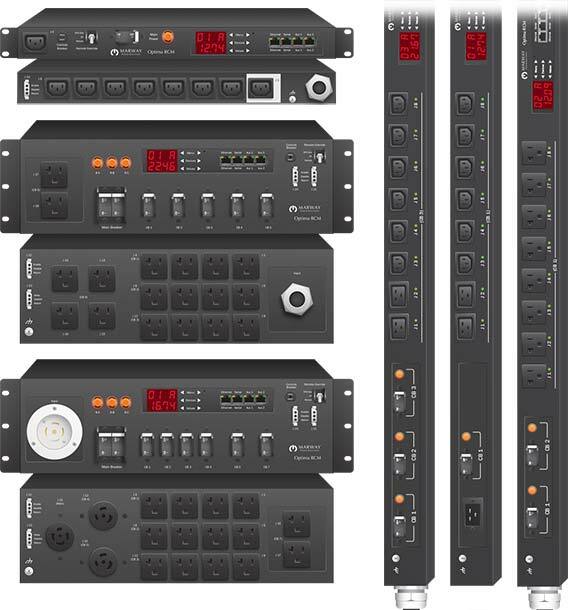 Marway’s PDU optimization includes configuration of chassis design, common and specialty connectors, switches, circuit breakers, indicators, metering, remote switching, software, as well as the integration of properly matched EMI filtering, surge suppression, power conversion, and more. Additionally, we are experienced with a number of industrial and military specifications, as well as managing projects through compliance testing and certification processes. Custom PDUs open the opportunity to counteract problems with facility power quality, use uncommon connections, incorporate speciality controls, and do this all in a single enclosure to save space, weight, and even cost—all things standard PDUs struggle to offer. Switched PDUs and metered PDUs for Ethernet. Industrial features like surge suppression and EMI filters to protect equipment investment. Compatible with remote EPO control panels. 1U, 3U, and vertical 0U configurations. The Optima RCM 8 Series of standard smart PDUs live up to their Marway industrial heritage. This standardized line of smart PDUs for single-phase and three-phase applications come in 0U, 1U, and 3U sizes. We’ve expanded on the traditional notions of switched PDUs and metered PDUs by adding several industrial features to the 1U and 3U models commonly requested in our custom products. Then we added the most typically requested network capabilities to deliver power monitoring, remote outlet switching, and scriptability over a variety of internet protocols such as HTTP/S, SSH, Telnet, SNMP and more. Smart in more ways than one — Marway’s Optima 8 smart industrial PDUs include not only Ethernet switching and power monitoring, but also surge suppression, EMI filtering, EPO circuits, and more. Optional integration of surge suppression and EMI filters to protect equipment investment. Optional discrete signal remote switching. Optional sequencing of outlet groups. Sometimes a simple product that’s ready to go is all you need. Marway’s Optima 5 Series of PDUs are designed for just those times — with the industrial extras you would expect from Marway. There are over 160 models available in 1U, 2U, 3U, and vertical 0U enclosures. 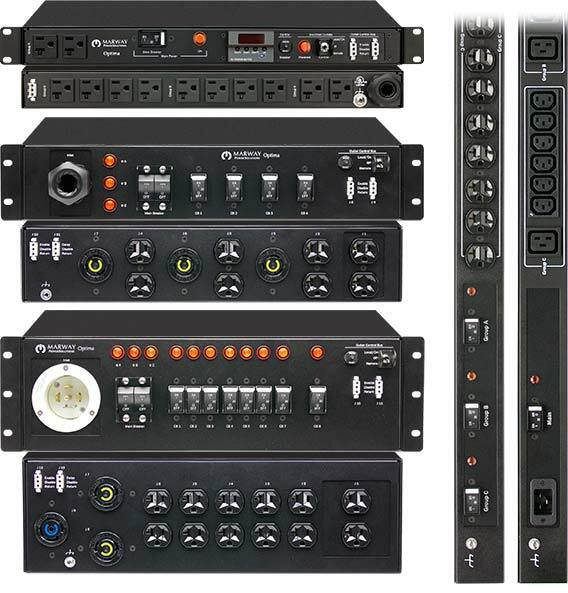 With a variety of NEMA and IEC outlet options, industrial control, and power conditioning features, we just might have a standard PDU that others would have to build as custom. Not like the other guys’s standard PDUs, Marway’s Optima industrial PDUs include options for surge suppression, EMI filtering, EPO circuits, and remote switching. Marway’s design and manufacturing processes have served customers needing a single, highly-customized system, to customers needing repeatable orders of hundreds of units per shipment. Whether you need that one specialized feature or chassis design that no one else offers, or whether you need a fully-collaborative design project to optimize a complex system, Marway can help. Likewise, when it comes to meeting production demand, Marway can create that one unit no one else will, or deliver hundreds of units to meet your production planning needs. Though many of our custom designs often need only very few units built, many others involve production runs of several hundred units.